Ideal for smaller families or couples that desire extra space on the campsite or at the festival, the Kobuk Valley 4 Plus is a large, 4-person dome tent with the added benefits of a large porch and innovative BlackOut Bedrooms so you won’t wake at first light. Quick and easy to set up thanks to its simple yet stable, dome construction, the Kobuk Valley 4 Plus can be quickly and easily erected in minutes. 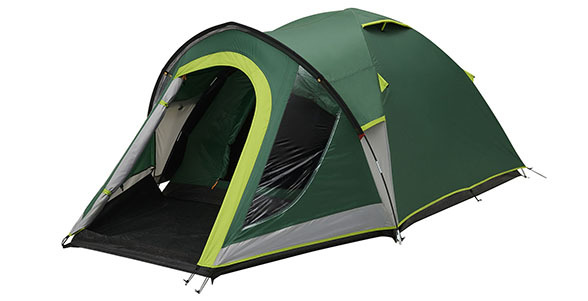 A peaked porch pole helps optimise internal head height and the comfortable tent boasts a large porch complete with PVC windows, ideal for storing gear or muddy boots. Coleman’s innovative BlackOut Bedroom offers a dark and temperate place to enjoy a good night’s sleep. The Kobuk Valley 4 Plus features a high-performance flysheet with a hydrostatic head rating of 4500mm. Light yet strong, fibreglass poles are wind responsive and ventilation openings help ensure good airflow throughout the tent, helping to reduce condensation. A riser PE groundsheet in the porch and fully integrated bedroom groundsheet ensures clean, dry and bug-free camping. Offering SPF 50 protection from the sun’s rays, the Kobuk Valley 3 Plus is treated with Coleman’s UVGuard™ technology. For added peace of mind, all fabrics are fire retardant.